T his is kind of a belated blog because the news is all over social media anyway. I came back from Europe on November 23 and the announcement came out November 24. Jet lagged is not the best condition for writing a blog post, so I took the easy way out and put up the links on Facebook and Twitter. 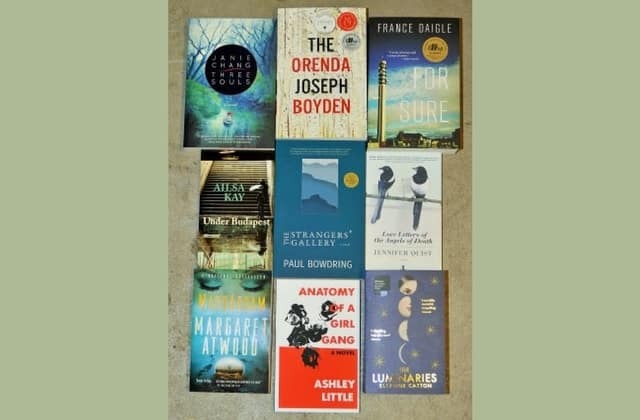 Besides, what else is there to say except that THREE SOULS is one of nine Canadian novels that made the long list for this literary prize? Hey, Eleanor Catton and I are both Canadian-Kiwis. If she carries dual citizenship that is. And there all resemblance ends. Colum McCann is in the running again. He is a great dinner conversationalist and shared my kale salad last year in Toronto and I’m sure that’s why he got a nomination this year. The cat still treats me with the same opportunistic affection. In other words, insincere and utterly unimpressed. Seriously though, it’s a huge honour. The nominations for this prize come from librarians. What author could ask for more?